The natural process of plant decomposition is as old as the earth itself. In nature, trees and plants die, and begin to decay. For small, thin grasses, the process is very quick, as little as a few weeks to a month. For big tree trunks, you may see them slowly decaying in a wooded area, over the course of a decade or more. When Man arrived on the planet, the process of decomposition was going on all around him. He never gave it a thought. Then one day, probably thousands of years ago, Man piled up some plant matter, and discovered it quickly decomposed. At the time, he probably thought little of it, until one day, he noticed.seeds from a prior year had sprouted inside of the decomposed pile. He marvelled at how fast and how big the plant grew. He harvested more and bigger vegetables from the plant. As it suddenly dawned on him what was going on, the value and usefulness of compost was discovered. The world of gardening has never been the same since. For countless centuries after, Man experimented with composting processes and techniques, along with the use of this valuable fertilizer and soil amendment. Today, we reap the benefits of this centuries long learning, as we show you how to make compost. 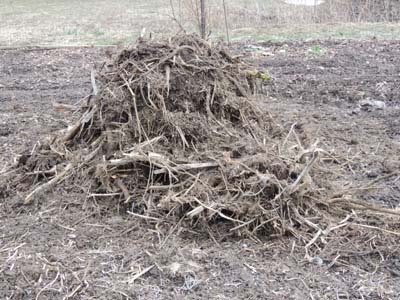 Over the long term, there is not much you can do wrong to a compost pile (also called the compost heap) Pile up any organic matter, and it decomposes over time. Simply pile plant waste into a heap in a corner of your garden, and it will decompose.....eventually. Most gardeners prefer to speed up the composting process, and avoid the pitfalls of bad odor and attracting unwanted pests. They turn to compost bins, barrels, and tumblers. A well maintained and active composting pile, converts organic material to compost in as little as 30 days. Left to nature, a compost heap can take from several months to a year or more, to completely decompose. The byproduct of active decomposition, is heat (and sometimes, odor). Have you ever seen a large pile of wood chips, at your local nursery in the middle of the winter? You may have observed it "smoking". A composting pile can actually become so hot, that it ignites. This occurs in large, town or industrial composting sites. The first step towards making compost, is to decide what technique to use. Passive - Just pile up the compostable materials and let nature do it's thing. It takes less effort on your part. But, it takes longer for plant matter to decompose. Proactive - You play an ongoing role in making the compost, by turning the pile, adding water as needed, and adjusting the ratio of Green to Brown materials . Your efforts will significantly speed up the decomposition process. Compost Pile or Heap - This passive method requires the least amount of effort. Simply pile up compostable materials, and let nature do the job. Be prepared to wait.... several months to a year. Some consider it unsightly. Burying Compost - Dig a hole or a trench. Put compostable material in it. Then, bury it. ... Out of sight, out of mind. Compost Bins and Barrels - It's an aesthetically neat and tidy way to store compost while it is decomposing. Unless you turn it from time to time, it is largely passive and will take a while to decompose. Compost Tumblers - The fastest way to make compost, is to use a compost tumbler. It makes turning and aerating the materials a cinch. Under ideal conditions, it makes finished compost in as little as 30 days! The right mix of materials Green (Nitrogen) materials and Browns(Carbon material). Microbes and bacteria, which break down component materials. Gather compostable materials. Add organic matter from your garden and yard. Chip or shred larger branches and plant stalks. The more surface area bacteria has to work, the quicker the decomposition. You don't have to add all the materials at once. You can add them as you get them, until the barrel, bin or pile is full. Include vegetable and plant waste from your kitchen, including egg shells, coffee grounds, tea bags, spoiled vegetables and fruits, etc. Alternate layers of green and brown materials. This helps to get the decomposition process started, and to keep it working. When decomposition is going on, we often call it "cooking". Keep the pile moist, but not wet. If you are able, turn the pile over from time to time, to maximize air circulation to the bacteria and microbes that "eat" and convert your pile into rich compost. Use the compost after it has almost completely turned into soil. It is rich in nutrients and minerals. Apply compost liberally around your plants as a mulch, or mix it into the soil. Did you know? Along with heat, odor is another common by-product of the composting process. Keep odor to a minimum, by turning the pile regularly. One of the most common culprits, is grass clippings piled too thickly. Mix all materials together well.